Sick of sandwiches? Need fresh, healthy lunch ideas? 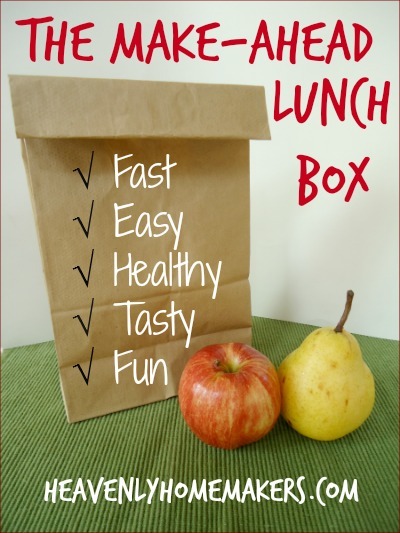 Whether or not you pack lunches or eat lunches at home, I believe we can all use some new, easy, and quick lunch ideas. Recipes that can be made ahead of time and pulled out for immediate use? Even better. Follow along with this Make-Ahead Lunch Box series – and share your ideas too! Feel free to switch out the ham for chicken, take out the cheese if you need to go dairy free, and stick with brown rice pasta if you need to eat gluten free. See how accommodating this meal is? Scoop salad into containers with lids. (I like using Pyrex bowls with lids like these or like these.) Store individual containers in the refrigerator until packing for a lunch. Be sure to pack an ice pack in the lunch box to keep the salad cold! Raspberry Lemon Cream Cups – recipe coming soon! I love that this pasta salad is a full meal all by itself – with whole grain pasta, meat, cheese, and lots of veggies! I love even more that it can be put together ahead of time and pulled out as needed. What are your favorite veggies to add to pasta salad? When I make tuna or salmon salad for our meatless Fridays I usually put in celery, onion, chives, peas, and olives, along with the cheese and pasta. I think adding cucumbers and peppers would be great also. The more veggies the better, right? That’s a lot of salad, lol! I know I can cut the recipe in half to downsize, but I’m also wondering: How far in advance have you made this and it has still kept a fresh and creamy taste when serving? I notice that some types of salads I make tend to “dry out” as the salad chills more than a couple of hours; the pasta absorbs the sauce. I end up needing to mix up and add more sauce to refreshen it. Have you had this happen with this recipe? I haven’t figured out why it happens to some of my salads; my guess is that it’s either a) mayo-based sauces absorb more readily or b) the type of pasta I use, which can vary in brand and shape. Adding a smidgen of oil would help. Maybe then, the italian salad dressing in this recipe will do the trick (oil in there) but I’m also going to keep your tip in mind. I have long-distance company arriving soon — my mother in law. She’ll arrive in a few days, at the lunch hour. I would love to make this the day before she arrives, to serve when she gets here, tired and hungry. I need to also think about what kinds of veggies hold up best in salads that chill 24+ hours.? I usually just rely on staples like peas, carrots and corn — I like the idea of something “else” for a change. Maybe try cherry or gape tomatoes that would stay whole? There are so many different kinds and colors at the farm markets this time of year! Peppers also keep well, as do finely diced broccoli and cauliflower. Now I know what to do when my past salads “dry out”! I’m so glad you asked so we can all learn together, thanks! Like Danielle said, a little oil will help. Since this recipe has Italian dressing in it along with cream dressing, the oil in the Italian dressing does help it to stay moist. This will stay good for about a week – so if you make some up for the week’s lunches, you should be set! Thanks, Laura! :) A week is longer than I would have guessed. Good news! Thanks for this!! 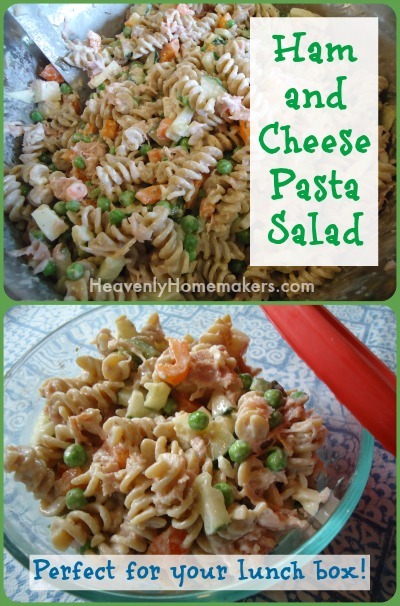 Love pasta salad, and I’m always running out of lunch ideas!